Luke, I am your master griller. 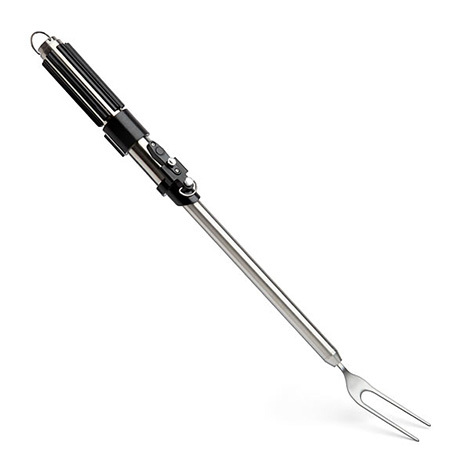 If you’ve been looking to combine your love of grilling and Star Wars, like we all are, it’s now possible with this Darth Vadar Lightsaber Barbecue Fork from ThinkGeek. “Darth Vader loves nothing more than a grilled weenie,” ThinkGeek astutely notes, which makes this fork perfect for the Jedi griller in your life. It’s shaped to look just like Darth Vadar’s lightsaber hilt, except scaled down to fit your hand, obviously. The fork can be yours for the bargain-of-a-intergallactic-century price of $24.99 and is available for purchase here.